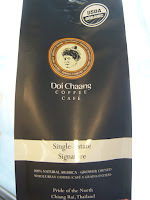 Wrapping up my overall Doi Chaang experience is their Single Estate Signature blend, a coffee that is blended post-roasting and was the dark horse of the three coffees I received (the other two had ratings on the bag to give me an idea of what to expect). I sampled it a la drip, french press and siphon. As I sipped the brew from my french press, I noticed a smoky aroma and taste, followed by a kick of pepper and then, a leveled out, smooth coffee with dollops of apple butter. This brew stood as the smokiest and the bitterest of the three batches. My drip fared less smoky, still showing up with a bit of bitterness and pepper as well as the apple butter middle and finish. This cup also tasted nuttier and was smooth-ish overall. The siphon produced the lightest of the three, demonstrating not much smokiness, but instead more cocoa. This cup was the least bitter and had flavors of apple as well as vanilla and nutmeg. The most enjoyable of the three in my estimation. This Single Estate Signature left its mark as a fair coffee; by no means a bench warmer but still not at the level of a home runner. Give this coffee a sip if you're looking for a good Thai medium/dark coffee. Haven't tried that one. At the moment I am using some Duang Dee Hill Tribe coffee. It's quite strong but I do like the flavor of it. I posted a photo of the box on my blog.